Today the group split into two groups. Half the group went repelling down waterfalls. 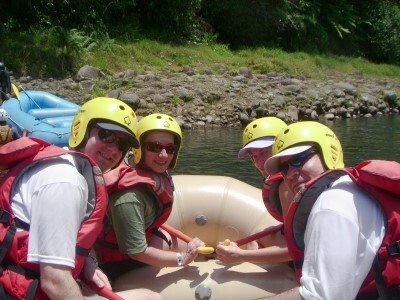 The other half went white water rafting on the Sarapiqui River. I chose the latter. After about a 90 minute ride to the boat launch, the group received a short lesson on safety and rafting. We then broke into groups of four or five and received life vests, paddles, and helmets, got in to the rafts, and on to the river. Our leader had us do a few exercises to get used to his commands, such as "left paddle", "right paddle", and "back paddle." We also had some fun splashing each other as well as other boats. 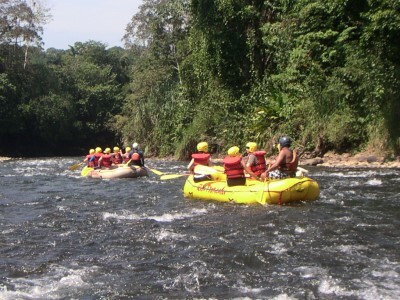 The Sarapiqui River is rated as class III rapids. However, with it being the end of the dry season the river level seemed low and not very challenging resulting in a few times where our leader had to get out of the raft and push us over rocks, but it was still an enjoyable experience. 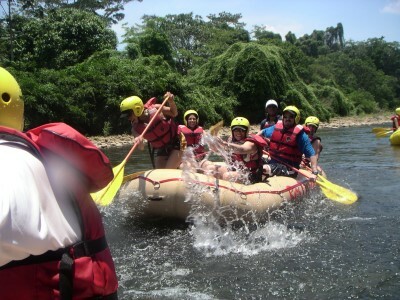 As we flowed down the river we stopped every now and then to observe local animals such as sloths and toucans. 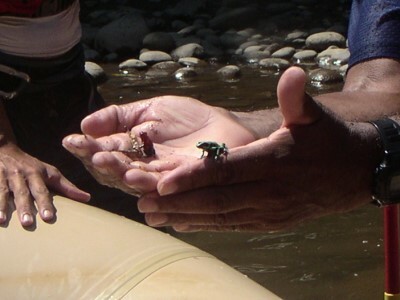 At one point one of the leaders walked into the forest and came back with two colorful poison dart frogs. Further down the river we pulled all of the boats to the side at a covered area along the river and our guides prepared a snack of fresh papaya, guava, and pineapple. Following happy hour, Nancy and I wandered off to explore the thermal springs. After walking through a number of rather crowded pools we managed to find one with a nice waterfall that wasn't so crowded. After enjoying the pool for a few minutes the lights went out at the entire resort. About a minute later we could see lights comming back on at the main area of the spa, but not where we were. Since we were comfortable we decided to just stay put until a man with a flashlight came by and asked us to leave saying there were snakes in the area. We don't know if there really were snakes or if he was just trying to get us to leave, but we decided not to find out and made our way back to the main swimming pool where we met up with other people from our group and ended up staying until closing. As we were walking back from the spa to the hotel area we heard a scream from the front of the group. When we got closer I saw what looked like a female hercules beetle. (females don't have a horn) When we got back to our rooms we found out that there was no electricity at the entire complex other than backup lighting. 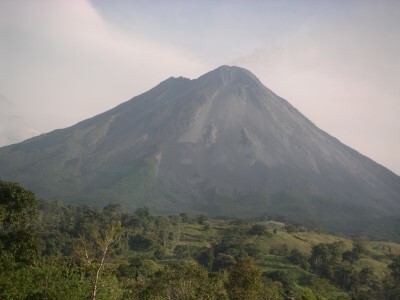 It turned out the blackout not only affect the Tabacon Spa, but due to a transformer on Arenal's substation that exploded, the entire nation was plunged into darkness.